Fukudate Noodles Factory’s Tartary buckwheat tea made exclusively from domestic buckwheat, mostly grown in Iwate Prefecture, features a smooth flavor and a mellow, slightly sweet flavor. Can be enjoyed easily using a pot just like with a conventional tea. Recently, Tartary buckwheat has been talked about in TV programs and continues to gain attention for containing over 100 times more “rutin”, a substance that is said to strengthen capillary vessels, than common Japanese buckwheat. We, at Furudate Noodles Factory, make our Tartary buckwheat noodles exclusively from domestic ingredients using buckwheat flour produced by our local contract farmers. Buckwheat grown in northern Iwate Prefecture, a region frequently subjected to cold damage in summer (the so-called Yamase region), features particular sweetness and rich flavor due to such cool climate. 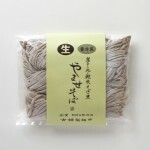 Yamase Soba is fresh buckwheat noodles that have a texture resembling genuine hand-made noodles. It is made with 60% buckwheat flour using mainly locally produced buckwheat. Only domestic buckwheat flour is used. Copyright (C) 古舘製麺所. All Rights reserved.